The Council for Leather Exports has formed a Section 25 company in the name of Leather Sector Skill Council. 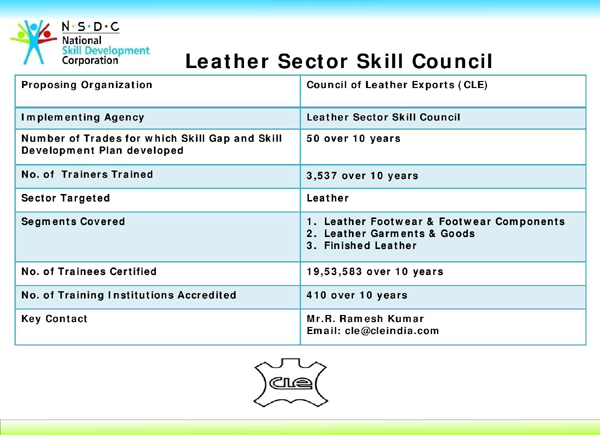 The purpose of the Leather Sector Skill Council (Leather SSC) is to play an effective role as the representative national agency facilitating the development of skills solutions for industry players in acquiring and developing the requisite skilled manpower needed to sustain the envisioned growth of the leather and leather goods industry and setting a foundation for the country to emerge as a global leader. The Leather SSC will co-ordinate with industry, education & training providers and government in ensuring capacity building for availability of trained and skilled manpower across industry segments and organization levels. The Leather Sector Skill Council is expected to provide certification to about 2 million learners/workforce by 2020, which will be 56% of the estimated new workforce of 3.6 million and 33% of the total workforce of 6.1 million by 2020.In the coming years the Leather Sector Skill Council will address the problem of shortage of trained manpower for performing shop floor level operations to a large extent.